« Did Frohnmayer illegally delete records from UO’s Presidential Archives? Back in 2009 I was trying to get a pdf copy of the “Oregon Attorney General’s Public Records and Meetings Manual” to post online. 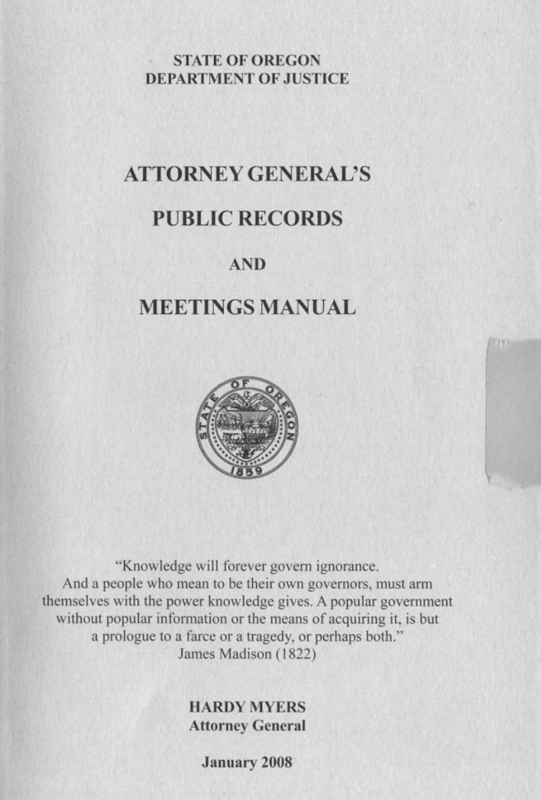 This is a 362 page book published by the DOJ every few years, explaining how citizens can use Oregon law to get public records, and giving DOJ opinions and court rulings on public records and open meetings. Just the sort of thing people should be able to easily access, in order to improve transparency and increase trust in government. At the time it was only available to the public in law libraries, unless you had the foresight to order a copy from the DOJ’s printing office. Please enclose a copy of this email with your check. Our IS people require you to follow the instructions below before we send you the PDF. The State, by and through DOJ, owns copyright to the Manual, and it is not to be redistributed without our permission in any format. This measure is to help protect the copyright. I then sent Attorney General John Kroger (Hardy Myer’s replacement as AG), and UO General Counsel Melinda Grier an email, letting them know I had illegally posted a copy of the Oregon AG’s copyrighted Public Records and Meetings Manual on my official UO hosted website. Right-to-know advocates are defying Oregon’s attorney general by putting a restricted government document on the Web for everyone to see. But the document at the center of this dispute isn’t a sensitive record such as a list of Oregonians’ Social Security numbers or names of concealed-handgun-permit holders. Rather, it’s the state’s Public Records and Meetings Manual — a bland legal guide updated by the state every two years to help the public and the media gain access to government documents and attend public meetings. The state Justice Department, which publishes the 11/2-inch-thick paperback book, doesn’t want it posted on the Internet by others. Until now, the only way to get the guide has been to buy it from the state for $25. The right-to-know advocates say they are stunned that the state is trying to stymie its free distribution on the Web. “I was shocked. Especially given what it says on the cover. It’s got this quote from James Madison about the importance of knowledge and a free society,” said University of Oregon economics professor Bill Harbaugh, one of those at odds with the state over the issue. Malamud runs Public.Resource.Org, which posts state laws and codes and IRS 990 tax forms for non-profits online, for free and open access. 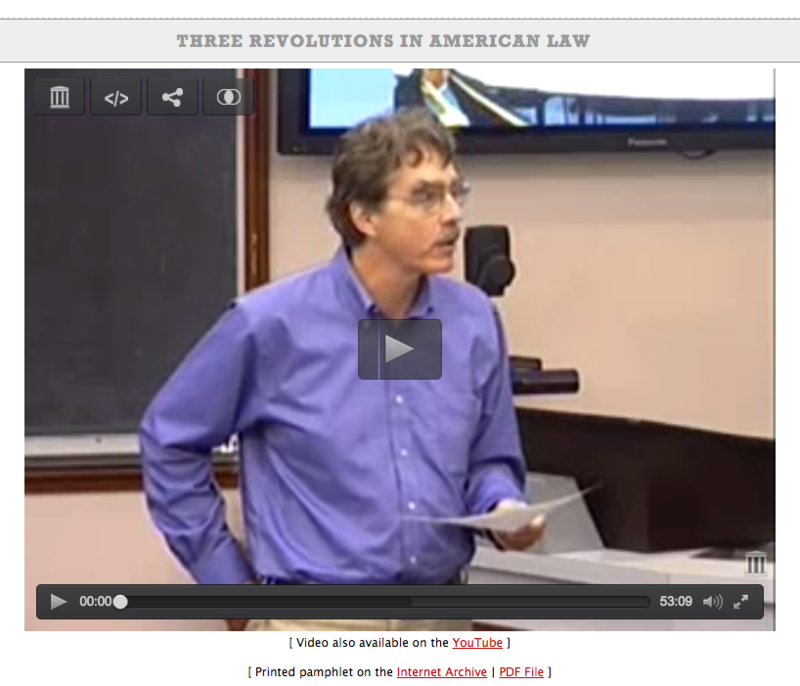 In 2007 he’d persuaded the Oregon Legislature to give up their claims that Oregon Laws are copyrighted. When he heard that the DOJ was now claiming their copyright on the PR Manual meant it couldn’t be posted online, he drove up to Salem, paid the AG their $25, took the PR Manual back to California, ground off the binding with a belt-sander, fed it through a sheet-fed scanner, and posted it on his website. Came out way nicer than mine. I like to think of myself as a handy guy, but I’d never realized the belt-sander was a vital tool for the cause of transparency. Malamud then wrote AG John Kroger a very polite letter explaining what he’d done, and if I recall correctly, suggesting that Kroger contact the Public Resource attorney – the famous Larry Lessig of Harvard – if he had any questions. Tim Gleason’s defense of UO’s public records practices falls flat with journalists. Fair enough, but I think I should be allowed to trot this out once a year or so. Absurd. Still absurd. At least they are not still harassing you about it. The current version of the PDF says “© [copyright symbol] 2014 State of Oregon acting by and through its Department of Justice”. It does not have a Creative Commons statement on it. So as an Oregon resident and taxpayer and a citizen of the United States, I commissioned this document. It is copyrighted by the State of Oregon, so shouldn’t that mean I own the copyright and can do what I please with the document? Obviously, I am not a lawyer. On a more practical note, what is the advantage to the people of a U.S. state, or of another state, when a state chooses to copyright its creative works? The copyright system was created to incentivize creativity for profit, but these documents are being created for other reasons, so profit is (or should be) outside of the discussion ($25 for a paperback book notwithstanding). It seems to me that the good of making all government-produced documents public domain far outweighs any potential harm. But that’s just my logical brain talking. It usually gets me nowhere in modern America. I’m not a lawyer, but it seems to me that a copyright provides some control over the contents. If its not copyrighted then anybody could make changes to it and post it on their website as the Oregon AG’s PR&MM, when it really isn’t. Thus with a copyright on it the AG has a tool to go after the perpetrator. Alternatively, perhaps the AG was collecting the $25/manual for the office slush fund and didn’t want some pesky professor upsetting the apple cart by posting the online PDF of it? Which would kinda put a dent in the sales income.